Russia's Nikolay Valuev claimed a majority points decision to defeat veteran American Evander Holyfield and retain his WBA heavyweight crown. Holyfield, 46, was bidding to become the oldest and first five-time heavyweight champion but was beaten in Zurich, Switzerland. Valuev now holds a 50-1 record with 34 knockouts, while Holyfield's 24-year-old boxing career looks over. Two judges had the fight 116-112 and 115-114 with the other scoring it even. "I saw it the other way from the judges but I'm not disappointed by my performance," said Holyfield. "He's a tough opponent, the sheer size of him is of course the main factor but he fights well with it too and that's the problem." Four-time world heavyweight champion Holyfield was conceding a massive 96lb in weight and 12in in height to 7ft Valuev. But despite Holyfield's greater mobility, the 35-year-old Russian edged the fight to take the decision. 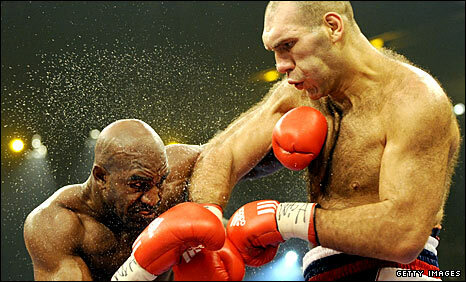 "He was a strong opponent and he made me work very hard for the win," said Valuev. Holyfield had hoped to eclipse George Foreman's record of claiming the heavyweight title at the age of 45. Fellow American Foreman knocked out Michael Moorer in 1994 to win the IBF and WBA crowns. But Holyfield, who last won a world title when defeating John Ruiz in 2000, must now be seriously considering his future in the sport. He had not fought since losing a one-sided decision to then-WBO champion Sultan Ibragimov over a year ago. "I thought I had done enough, now I will just have to go home and think about my future," said Holyfield. Holyfield has been crowned world champion on four occasions but since 2001 he has won only five of 11 fights. He claimed his first heavyweight title in 1990, beating James Douglas, having won previous world titles at cruiserweight.